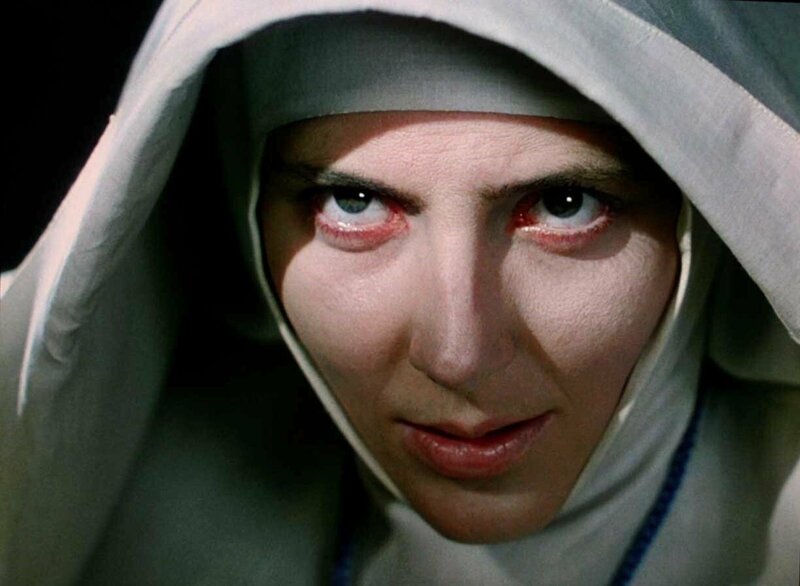 Powell and Pressburger’s 1947 film Black Narcissus is an epic of Biblical proportions. But the most monumental part is not its grandiose sets or the way in which the duo uses colour, it’s the breakdown of Kathleen Byron‘s Sister Ruth. A group of Anglican nuns are sent to the Himalayas in the hope of starting a school and a hospital. They are isolated, and this condition leads to a tug and pull between their spirituality and human desires. None more so affected is Sister Ruth when she falls in love with Mr. Dean. As her love for him grows, so does the distance between herself and her faith. When David Farrar’s Mr. Dean and Deborah Kerr‘s Sister Clodagh seem to be growing closer, this sends Sister Ruth into a jealous rage. And when Mr. Dean rejects her, her madness becomes more physically apparent – it’s frightening. Sister Ruth’s frailty is gone. No more is she clothed in the white nun’s habit. Dressed in black, and with her eyes bloodshot, she blends in with the darkness like a demon, waiting to enact undue revenge on Sister Clodagh, leading to a violent and satisfying climax. Which Scene Stealers test your faith? Which make you crave bloody vengeance? Let us know in the comments below.